"During the 345 year history of Wakefield, the Hartshorne name has been one which has also been associated with community involvement. One of the first settlers, Thomas Hartshorne was a tailor by trade and was an active member of the community, serving as a Selectman in 1661 and 1667 during the early years of Reading. Col. James Hartshorne, a resident of the home now known as the Col. James Hartshorne House on Church Street, was another Hartshorne who was involved in the community. He was emplyed in the shoe manufacturing industry, but was most famous for his role as a Commander in the town militia. In 1797, Col. Hartshorne entered the calvery [i.e. cavalry] and distinguished himself as a leader among his fellow men. He purchased the Lafayette House (later known as the Hartshorne House) in 1803 where he resided until his death in 1870. He served as a Selectman in 1840 and 1841. Col. Hartshorne's son, Charles F. Hartshorne, continued his father's military heorics, serving in the Civil War and returning to serve his community as Town Clerk. He served as Town Clerk from 1872 to 1911, a record 39 years. Since the position of Town Clerk was an unpaid one, Charles was also involved in an insurance business which he conducted from the Town Clerk's Office. Following his death in 1911, the position of Town Clerk was held by his son Frederic S. Hartshorne until 1939. Frederic was already involved in his father's business, having joined the company in 1892. When he assumed the role as Town Clerk, he continued to conduct business from the office until he moved the growing insurance firm to Chestnut Street in 1939. He, too was involved in the community, serving as a member of the Board of Assessors and serving as Superintendent of the Sewer Department. The community involvement continued with Frederic's son, Frederic Manning Hartshorne, who was a Senior Engineer for the town. 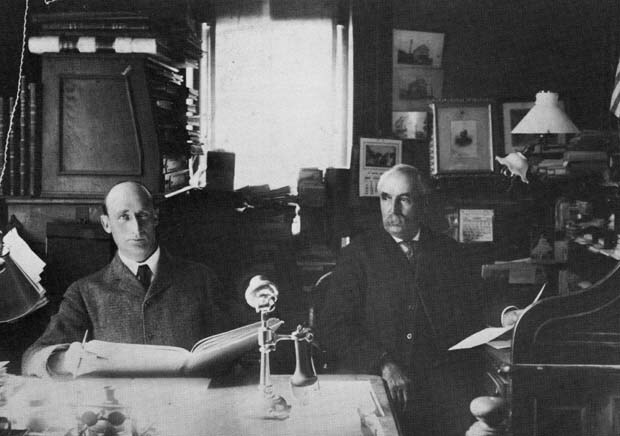 His son Joseph, who passed away in 1958, was also involved in the community, having served as a Call Fireman and as a member of the Municipal Light Dep;Caption: Frederic S. Hartshorne, left and Charles F. Hartshorne, right in 1904. Photo courtesy of the Hartshorne Family. “Hartshornes,” NOBLE Digital Heritage, accessed April 20, 2019, https://digitalheritage.noblenet.org/noble/items/show/6973.